Museum-lovers will get to explore Ceylon Tea Museum and World Buddhist Museum. Visit Commonwealth War Cemetery and Shri Bhakta Hanuman Temple for their historical value. Get out of town with these interesting Kandy side-trips: Matale (Knuckles Mountain Range, Euphoria Spice and Herbal, & more), Mackwoods Labookellie Tea Centre (in Nuwara Eliya) and Ramboda Falls (in Ramboda). Spend the 13th (Thu) surrounded by wildlife at Elephant Freedom Project. The adventure continues: explore the different monuments and memorials at Kandy Garrison Cemetery, get engrossed in the history at Arankelle Ancient Monastery, stop by Jayamali Batiks Studio, and step into the grandiose world of Royal Palace of Kandy. To find photos, where to stay, and more tourist information, refer to the Kandy travel itinerary creator. Colombo to Kandy is an approximately 1-hour flight. You can also drive; or take a train. April in Kandy sees daily highs of 37°C and lows of 28°C at night. 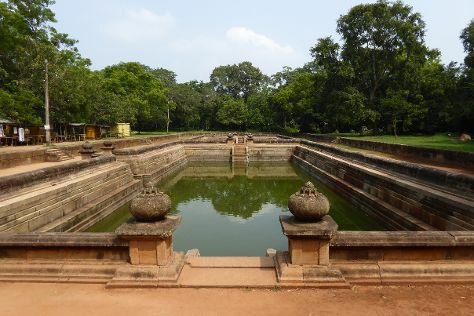 Finish up your sightseeing early on the 14th (Fri) so you can go by car to Anuradhapura. Visit Jaya Sri Maha Bodhi and Sri Maha Boodhi Temple for their historical value. Your cultural itinerary includes sights like Isurumuniya Temple and Abhayagiri Dagoba. Spend the 19th (Wed) exploring nature at Vilpaththu National Park. The adventure continues: contemplate in the serene atmosphere at Dagoba of Thuparama, contemplate the waterfront views at Twin Baths (Kuttam Pokuna), explore the ancient world of Ranmasu Uyana, and make a trip to Isinbassagala. For maps, traveler tips, reviews, and other tourist information, read our Anuradhapura trip generator. Getting from Kandy to Anuradhapura by car takes about 3 hours. Other options: do a combination of taxi and train. Finish your sightseeing early on the 20th (Thu) to allow enough time to drive to Jaffna. 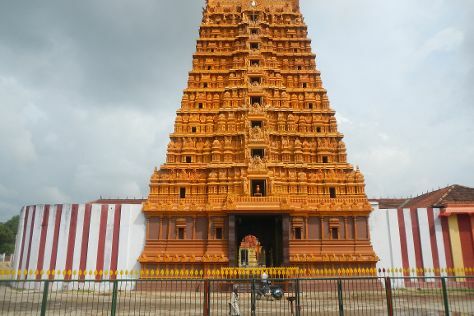 A center of Tamil culture, the city of Jaffna remains in the process of rebuilding after suffering greatly during the civil war. Your cultural itinerary includes sights like Nallur Kovil and Jaffna Fort. Visit Naga Pooshani Ambal Kovil and Nagadipa Purana Vihara for their historical value. There's much more to do: kick back and relax at Casuarina Beach, pause for some photo ops at Maruthanamadam Anjaneyar Temple, contemplate in the serene atmosphere at Dambakola Patuna Sangamitta Temple, and browse the collection at Jaffna Public Library. To find maps, more things to do, photos, and more tourist information, go to the Jaffna trip planner. Drive from Anuradhapura to Jaffna in 3.5 hours. Alternatively, you can take a train. On the 23rd (Sun), wrap the sightseeing up by early afternoon so you can drive to Nilaveli. The coastal resort town of Nilaveli draws visitors with its beaches, dive spots, and seaside hotels. 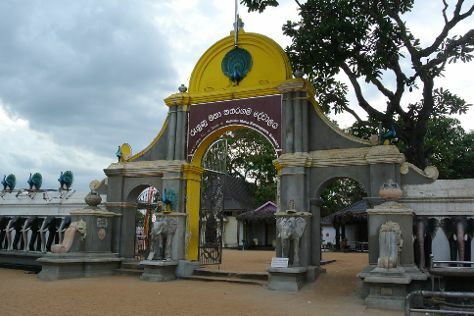 Get a sense of the local culture at Trincomalee War Cemetery and Koneswaram Temple. Relax by the water at Nilaveli Beach and Marble Beach. Venture out of the city with trips to Trincomalee (Arisimale Beach & Hoods Tower Museum). Next up on the itinerary: see some colorful creatures with a scuba or snorkeling tour and contemplate in the serene atmosphere at Seruwila Mangala Raja Maha Vihara. To find traveler tips, photos, reviews, and other tourist information, read our Nilaveli itinerary planner. Drive from Jaffna to Nilaveli in 4.5 hours. Alternatively, you can do a combination of train and taxi. Finish your sightseeing early on the 26th (Wed) to allow enough time to drive to Polonnaruwa. Deepen your sense of the past at sights like Polonnaruwa Vatadage and Lankathilaka Image House. Museum-lovers will appreciate Sigiriya Museum and Pethikada. Explore the numerous day-trip ideas around Polonnaruwa: Sigiriya (Sigiriya World Heritage Site & Pidurangala Rock) and Habarana (Hurulu Eco Park & Ritigala Forest Monastery). Spend the 2nd (Tue) exploring nature at Angammedilla National Park. Next up on the itinerary: appreciate the history behind Gal Vihara, contemplate the long history of Lotus Pond, explore the ancient world of Medirigiriya Vatadage, and admire the landmark architecture of Polonnaruwa Archaeological Ruins. To see where to stay, photos, and more tourist information, you can read our Polonnaruwa vacation planner. Drive from Nilaveli to Polonnaruwa in 2.5 hours. Wrap up your sightseeing on the 3rd (Wed) early enough to travel to Kalkudah. Kick off your visit on the 4th (Thu): kick back and relax at Pasikudah Beach and then kick back and relax at Passikudah Beach. To see more things to do, maps, photos, and more tourist information, go to the Kalkudah trip itinerary planner. Traveling by car from Polonnaruwa to Kalkudah takes 1.5 hours. Wrap up your sightseeing on the 5th (Fri) early enough to travel to Kataragama. Kataragama is a pilgrimage town sacred to Buddhist, Hindu and indigenous Vedda people of Sri Lanka. Start off your visit on the 5th (Fri): contemplate in the serene atmosphere at Sella Kataragama Temple. To see more things to do, other places to visit, traveler tips, and more tourist information, go to the Kataragama trip itinerary builder. Getting from Kalkudah to Kataragama by car takes about 4.5 hours. In May in Kataragama, expect temperatures between 38°C during the day and 29°C at night. Wrap up your sightseeing on the 7th (Sun) to allow time to travel to Netolpitiya. Most people take a trip to Netolpitiya to enjoy a classic beach holiday. 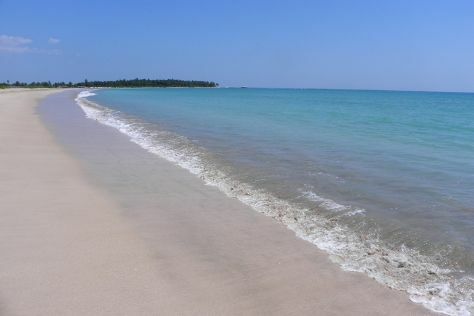 You'll get in some beach time at Goyambokka Beach and Medilla Beach. You'll discover tucked-away gems like Mulgirigala Raja Maha Vihara and Mawella Beach. Take a break from Netolpitiya with a short trip to Bundala National Park in Hambantota, about 52 minutes away. To find reviews, photos, and other tourist information, you can read our Netolpitiya online itinerary creator. Getting from Kataragama to Netolpitiya by car takes about 2 hours. In May in Netolpitiya, expect temperatures between 38°C during the day and 29°C at night. Finish up your sightseeing early on the 10th (Wed) so you can travel to Galle. Get some historical perspective at Dutch Reformed Church and Saint Mary's Church. 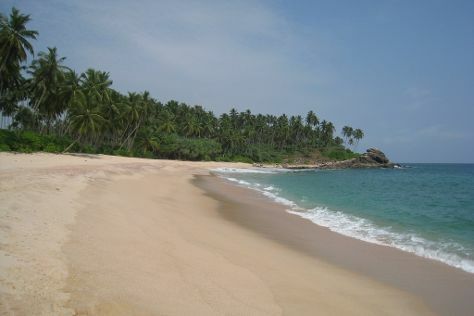 We've included these beaches for you: Polhena Beach and Unawatuna Beach. Get out of town with these interesting Galle side-trips: Hikkaduwa (Community Tsunami Museum, Tsunami Honganji Vihara, & more), Tsunami Photo Museum (in Telwatta) and Matara (Hiriketiya Beach & Matara Beach). 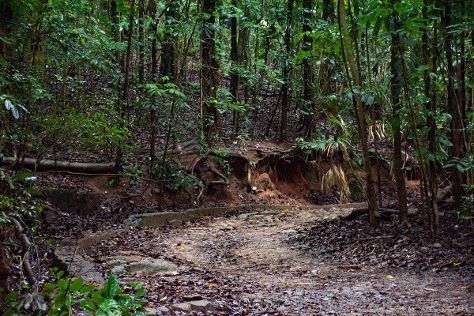 Next up on the itinerary: examine the collection at Martin Wickramasinghe Folk Museum Complex, kick back and relax at Mihiripenna Beach, stroll through Jungle Beach, and surround yourself with nature on a nature and wildlife tour. To see traveler tips, ratings, reviews, and other tourist information, read Galle holiday planner. You can drive from Netolpitiya to Galle in 2 hours. Cap off your sightseeing on the 18th (Thu) early enough to go by car to Beruwala. Beruwala is a town in Kalutara District, Western Province, Sri Lanka, governed by an Urban Council. Do some cultural sightseeing at Colombo National Museum and Kande Viharaya. 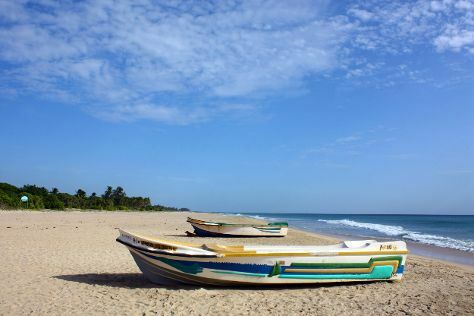 You'll discover tucked-away gems like Beruwala Beach and Ahungalla Beach. You'll find plenty of places to visit near Beruwala: Kalutara (Richmond Castle, Nature & Wildlife Tours, & more), Sri Vijayarama Viharaya (in Ambalangoda) and Madu River (in Balapitiya). Next up on the itinerary: kick back and relax at Bentota Beach, look for gifts at Western Leather, admire the natural beauty at Brief Garden - Bevis Bawa, and look for all kinds of wild species at Kosgoda Sea Turtle Conservation Project. For more things to do, where to stay, photos, and other tourist information, read Beruwala vacation trip planner. Traveling by car from Galle to Beruwala takes 1.5 hours. Alternatively, you can take a train. In May, daily temperatures in Beruwala can reach 36°C, while at night they dip to 30°C. Finish your sightseeing early on the 23rd (Tue) to allow enough time to drive back home.